Our 2013 Alpaca Yarns Are Beginning to Arrive! We had an early Christmas present today at the farm when the first of our 2013 yarns arrived. Once again, New Era Fiber Mill has done a beautiful job. It is always so exciting to open each bag and feel the beautiful yarns and see how they turned out. The process from Alpaca to Yarn is a long, multistep process that begins with always breeding for the alpacas that will produce the finest and greatest quantity of this wonderful luxury fiber. Before shearing we work to make sure our pastures are as clean as possible to reduce excess debris in their fiber. Shearing day rolls around once a year in May, and we take care with the fiber as it is comes off the alpaca to sort it into the different grades of fiber and prepare it for further sorting and processing decisions. From there, the fiber is bagged and sent to the mill to be made into rovings and yarn. This September, we filled the car and personally delivered 254 pounds of fiber to the fiber mill to be made into yarn, rovings, batts and rug yarns. Today, we began to see the results of all that hard work as the first of many boxes of fiber arrived. 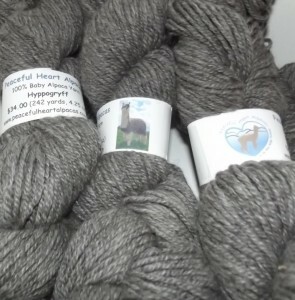 We received 7 different batches of yarn and two incredible royal baby alpaca rovings. I am now in the process of labeling the yarns and putting them out in the store and online. Keep an eye on our online store for new yarns as I will be adding them as they arrive. Today we were very excited by all the yarns, but in particular two new yarns. This is the first year we have made any yarns from our beautiful and unique, silver gray Hyppogryff. It turned out as lovely as he is. I can’t wait to make something with this lovely yarn (if it stays in stock long enough). The second exciting yarn, is a brand new weight. 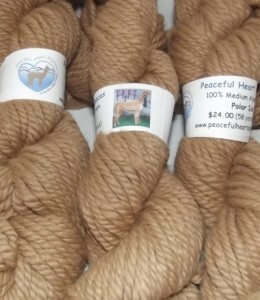 For the first time, we have a bulky, three ply yarn available in the gorgeous fawn color of our Champion herdsire Polar Ice. This yarn will work up fast using a size 11 or larger knitting needle. Again, a yarn I am looking forward to using to create something fabulous. Not to take anything away from the other yarns. This batch consisted our many of our finest yarns, including royal baby alpaca yarns in dark fawn from Gabriel; an incredible beige, royal baby alpaca yarn (17 microns) from our fiber superstar Lucky; an elegant heathered baby alpaca yarn from three of our lovely ladies Ruthie (maroon), Klarice (fawn) and Snobelle (white); a light fawn baby alpaca yarn from siblings Ashley and Coriander; and a royal baby alpaca yarn in white from Angelica and White Owl. The royal baby alpaca rovings in pale fawn from our lovely Elise, and dark fawn from our superior Becket (16.5 microns) will be perfect for any spinning or felting project. Some of the yarns are online already, and the rest will be going up online soon (as well as onto the shelves). We are now anxiously awaiting the arrival of the rest of our yarns.